The large sun room windows that get beat on all day in Fall River, MA. 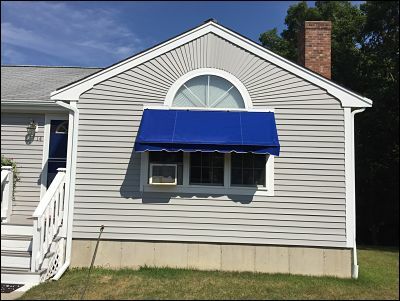 Canvas awnings give a cool look to an otherwise bland set of windows. They can also help to limit those high summer electricity bills by shading and cooling indoor rooms susceptible to a large amount of sun and taking some of the pressure off of your AC. This will not only bring down electricity costs, but will do so in an environmentally friendly way. 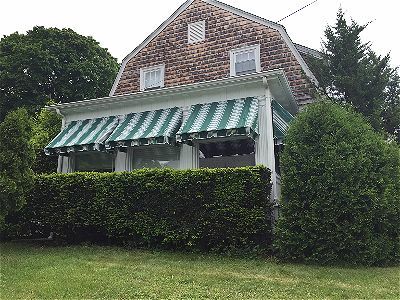 A wide canvas window awning on the southern exposed side of the house. You can see just from the above picture how much shade just one canvas window awning provides. Now this customer can open their shades without fear of a temperature spike and a blinding light in their living room. They might even be able to put away the AC too. 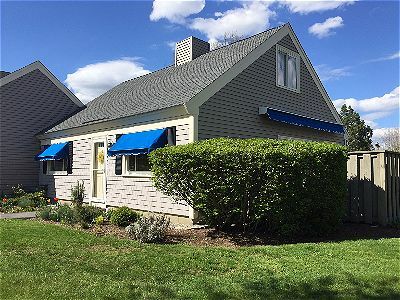 Two window awnings and a retractable on the deck will keep this house cool all summer long.